Josh Pais (born June 21, 1964) is a native New Yorker who is the voice of Raphael in the first Teenage Mutant Ninja Turtles Movie. He also portrayed Raphael in the suit, and is the only actor to play both physical and voice roles as a turtle. 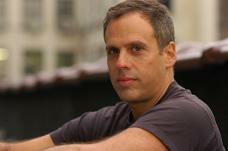 Josh Pais has appeared in many other movies and television shows, including The Sopranos. He played Assistant M.E. Borak in 15 episodes of the series Law & Order, between 1990 and 2002. He also played the Spanish teacher in the film Assassination of a High School President. Pais is the son of Lila Lee (née Atwill) and Abraham Pais, a Dutch-American Jewish physicist, professor and writer. Pais married actress Lisa Emery on August 27, 1990; the two have a son, actor Zane Pais. Pais and Emery divorced. Pais married Marie Forleo.